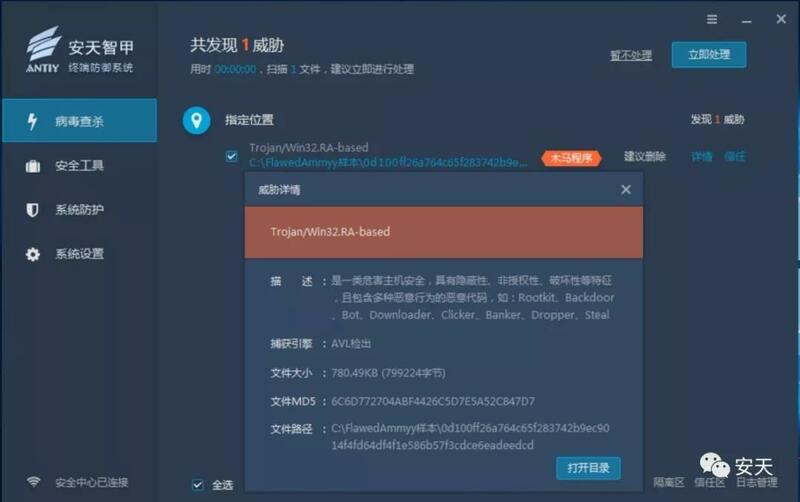 Recently, Antiy CERT (Computer Emergency Response Team) discovered a new type of remote access Trojan when sorting out network security incidents. 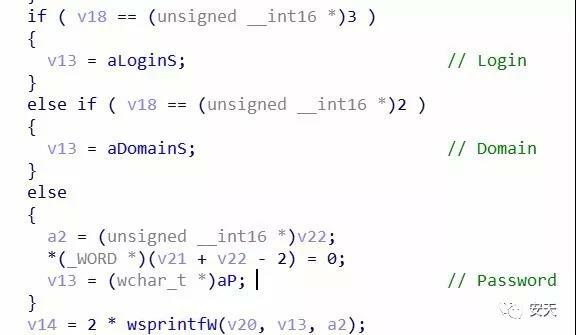 The Trojan/Win32.RA-based belongs to the "FlawedAmmyy" family and is a modified version of the remote control software Ammyy Admin V3 leak source code. According to Antiy researchers, it allows an attacker to gain full access to infected computers and execute a series of commands including creating process execution commands, collecting computer information and sending, loading resource files and running, monitoring keyboard and mouse operations, and file operations. Therefore, Antiy reminds network users to confirm whether the source of the email is reliable when sending and receiving emails. Do not click or copy the URLs in the emails, and do not easily download attachments from unknown sources. It has been proved that Antiy Intelligent Endpoint Protection System (IEP for short, hereinafter referred to as Antiy IEP) can achieve effective defense against FlawedAmmyy. The content of this tag was collected from Antiy Threat Analysis System and VirusTotal. After started, the FlawedAmmyy sample will release 4 dll files and 1 7z files, which are System.dll, UserInfo.dll, Nsis7z.dll, nsExec.dll and test.7z respectively. The relationship between the sample files is shown in Figure 2-2. The FlawedAmmyy sample first loads System.dll, and then calls the export function System.call multiple times to traverse the processes in the system to find out if there are anti-virus engines such as avgsvc.exe, a2service.exe, and MBAMService.exe in the system. The FlawedAmmyy sample will then load UserInfo.dll and call the export function UserInfo.GetAccountType to determine if the current process is running with administrator privileges. 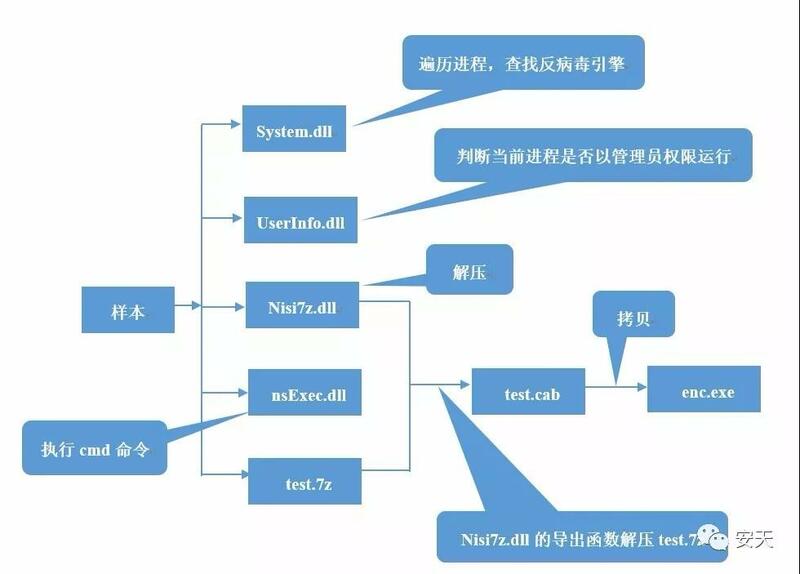 The FlawedAmmyy sample create directory C:\Documents and Settings\All Users\Application Data\Microsoft\Enc, and create encrypted test.7z in the directory, then call Nsis7z.dll export function Nsis7z.Extract to extract test.7z, decompress the password is HbMEAKQo6UJ3i3ZdywumRC6J2. Test.7z decompresses to get test.cab. Then look for wmihost.exe, settings3.bin, and wmites.exe in the C:\Documents and Settings\All Users\Application Data\AMMYY directory and in the C:\Documents and Settings\All Users\Application Data\Foundation directory. If no related files are found, copy test.cab to the \Enc directory and rename it to enc.exe. Before running enc.exe, the FlawedAmmyy sample will call the export function Exec of nsExec.dll to execute the cmd command, stopping the ammyy and foundation services. The FlawedAmmyy sample will run the code corresponding to case 0x1F to generate the service creation command, then call the export function Exec of nsExec.dll to execute these commands, create the ammyy and foundation services. Each time the Exec function is executed, nsExec.dll is copied to a temporary file ns%s.tmp, and then the temporary file is used to execute the command. After the command is executed, the temporary file is deleted. After the FlawedAmmyy sample runs, enc.exe will reside in the system. After enc.exe runs, it releases a PE file and then runs this PE file in memory for remote control. After the PE file is run, it will connect to the C2 server 179.60.146. *:443, and the server will return "0x2D" data, indicating that the connection is successful. When receiving the control command sent by the C2 server, the FlawedAmmyy sample will judge. When the instruction is "0xC", the data will continue to be sent. When the instruction is not "0xC", the corresponding operation will be performed according to the control instruction. The PE file of the FlawedAmmyy sample contains two resource files for obtaining login credentials: resource 151 (32-bit program) and resource 152 (64-bit program). The FlawedAmmyy Remote Control Trojan not only includes these features, but also includes some of Ammyy Admin’s features such as remote desktop control, file system management, proxy support, and audio chat. In order to prevent property damage caused by infection with FlawedAmmyy, it is necessary to carry out safety protection. 4、 If the terminal is infected with this category or other types of malware, immediately use anti-virus software such as IEP to clear it, or you can call the service and consultation hotline 400-840-9234 for consultation. Through the attack and defense test, the terminal installed with IEP can effectively alert and intercept the malicious behavior of FlawedAmmyy to achieve effective protection.